With Thanksgiving behind us, chances are you’re done with turkey until Christmas so here’s a ‘Best of’ fried chicken sandwich list to keep your foodie cravings running strong. Food trends come and go, especially in Los Angeles where eating healthy one minute can be a craze followed by a craving for delicious, decadent delights the next. Whether it’s standing in line for hours for a hearty hamburger or even frozen yogurt (remember when that was a thing? ), foodies are always looking for the next new sensation whether it be Brussel sprouts, cauliflower, gourmet pizza, poke or a fried chicken sandwich. 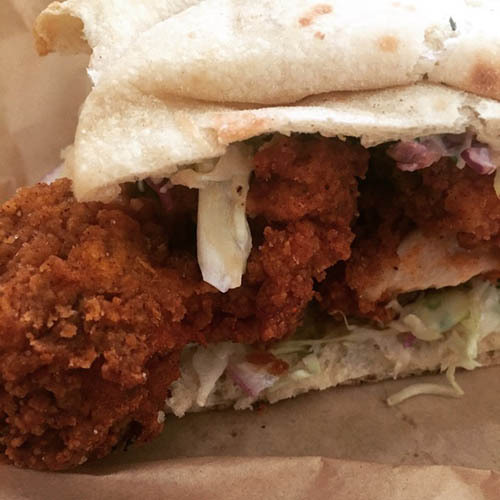 Two current food obsessions in L.A. right now are poke, and fried chicken sandwiches. On a whim, I started trying fried chicken sandwiches and then decided it was something worth writing about. The following isn’t a ranking of the best fried chicken sandwiches but more of a list of some of the city’s tastiest fried chicken sandwiches. But since this is a list I did come up with a Number One (for now anyways) but I see this as an ever evolving list that can always be updated. So please, do let me know who you think has the best fried chicken sandwich in town. 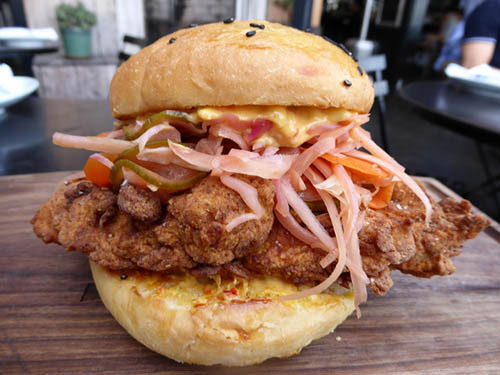 When you’re talking about fried chicken sandwiches in L.A., you have to start with Son of a Gun. It’s the measuring stick of all fried chicken sandwiches. It’s probably the most well-known and most written about sandwich in Los Angeles. But the fried chicken sandwich competition got really fierce this summer with the opening of Chinatown’s Howlin’ Ray’s and their out of this world Nashville hot chicken. And once folks heard I was on a fried chicken sandwich quest some wondered if I would include Chick-fil-A while others complete scoffed at that idea. Truth be told, they do make a tasty and affordable sandwich without bells and whistles. But it was a train ride to Pasadena where I discovered my favorite fried chicken sandwich. Here’s the story so far. While Pasadena’s The Raymond is a stellar restaurant, home to the best seafood in Pasadena and also one of the best cuts of meat I’ve ever had with its dry aged prime bone-in rib eye, I had never been for lunch, which is the only time you can order its Calabrian Chili Fried Chicken Sandwich. Made with Italian Calabria chili mayo, crispy pepperoni, melted cheddar, lettuce and red onions on a homemade Portuguese sweet roll, I wasn’t looking for gourmet fried chicken sandwiches but kudos to Executive Chef Tim Guiltinan for creating such a sensational and savory sandwich, and big ups to Chef for using dark meat, which keeps the sandwich from being too dry. At $16 a pop, the sandwich comes with your choice of French fries, homemade potato chips, sweet potato fries or a side salad. So while The Raymond’s cozy 1886 Bar has the best cocktail in Los Angeles with its Smoking Jacket, the restaurant also has the best fried chicken sandwich among other top notch menu items. Riding the Gold Line to drink and not drive and save on pricey car service was not only genius but created an adventure where the payoff, in this case damn good eats and drinks, was an E-ticket ride. The Raymond is located at 1250 S. Fair Oaks Avenue in Pasadena. 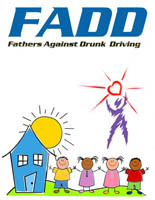 Call 626-441-3136. “All we do is serve fried chicken; all day,” declared Chef Johnny Ray Zone of Howling Ray’s. And it’s because they only serve fried chicken that their fried chicken sandwich features the best chicken in town. Howlin’ Ray’s authentic Nashville quarters cut chicken is so good that people wait up to three hours on weekends to order. But Chef Johnny Ray, who has also worked with chefs Gordon Ramsey and Thomas Keller, credits the popular fried chicken sandwich as his wife Amanda’s creation. Served on butter buns, The Sandwich, as it is called on the menu, features boneless breast, slaw, comeback sauce, and pickles. The most popular way to order the sandwich is medium or hot, but be warned that Howling Ray’s hot is fiery hot. While I enjoyed The Sandwich with medium heat, I really liked it served Country (no heat) as that allowed me to enjoy the tasty fried chicken and also play with the heat myself by being able to add spice to my liking. At $11 a pop for this oversized sandwich, it’s one of the best deals in town. Howlin’ Rays is located at 727 N. Broadway in Chinatown’s Far East Plaza. I have to hand it to Chef Hunter Fox of Farmboy Kitchen for thinking outside the box with his tasty Fried Chicken & Kimchi Sandwich, which was among the best I tasted. Prepared with fresh fried Mary’s chicken breast topped with house made kimchi and roasted garlic lemon aioli on a sesame bun served with Farmboy Chips, this $12 combo is just packed with flavor. The breast meat is solid but the homemade kimchi is a really nice touch, as are the homemade potato chips with Indian seasoning. It’s good eats like this that is helping Farmboy Kitchen be part of the revitalization of Hollywood. This is a solid sandwich that won on just about every level. Farmboy Kitchen is located at 1050 Vine Street. 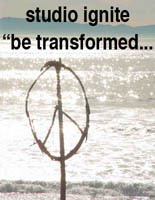 Call 323-848-4790. 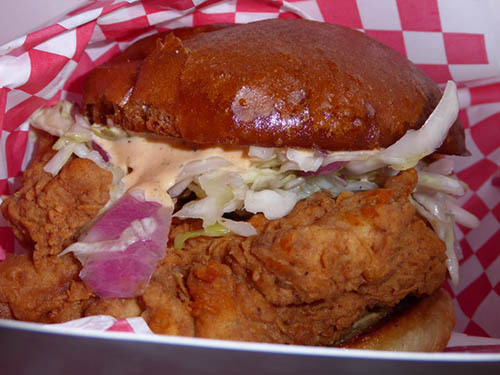 It has been called the best fried chicken sandwich in town. It has even graced the covers of magazines and is an Instagram favorite, so you can’t talk fried chicken sandwiches in L.A. without talking about Son of a Gun. A beast of a sandwich, this bad boy features breast meat, spicy b&b pickle slaw and rooster aioli. The spicy peppers and pickles are a nice touch and the dressing is reminiscent of Thousand Island dressing. Impressive in stature and taste, the fact that this sandwich costs $17 and is served ala cart is somewhat off putting. Now that I know it’s not the best fried chicken sandwich in town, the price seems hefty but it is one of those things you just have to do at least once. Son of a Gun is located at 8370 W. 3rd Street. 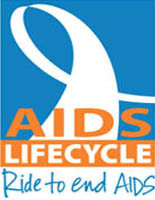 Call 782-9033. Being just two doors down from Son of a Gun might make some worried about having a fried chicken sandwich on its menu but The Churchill, and its new Executive Chef Stephen Trujillo, has stepped up to the challenge and put together an affordable deal that makes me want to dine al fresco at The Churchill instead of overpaying for an albeit killer sandwich. 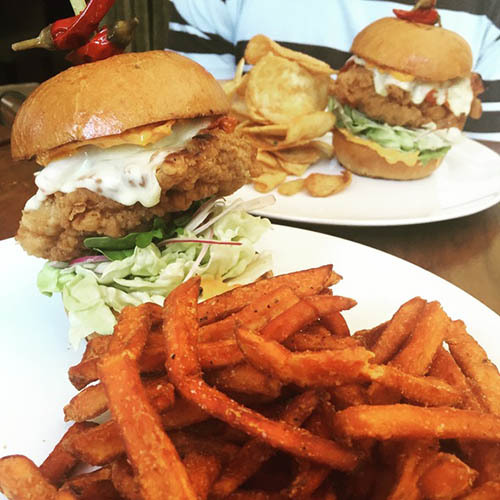 Thirteen dollars at lunch or $14 at dinner will get you a solid fried chicken sandwich with French fries at The Churchill whereas you’re looking at $20 plus tip for just the sandwich at Son of Gun. At some point, price and value has its place when ranking sandwiches. While it’s nice to point out what sandwich is best, when you’re shelling out hard earned bucks value is a factor. 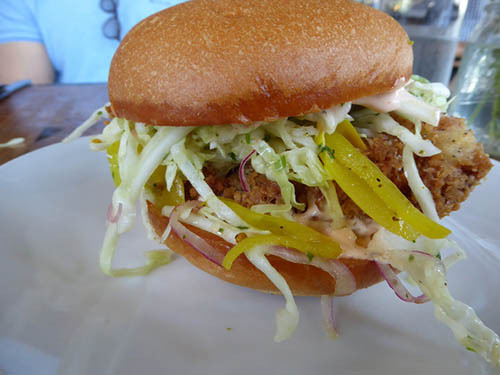 And Chef Stephen’s sandwich is a pleasing mix of fried chicken breast, sweet and spicy coleslaw and pickles on a brioche bun. And what’s Chef secret? He’s not afraid to share. Call it his ace up his sleeve, but in this case, science in the kitchen has created a very tasty fried chicken sandwich that is not only a great deal but is also a damn delectable dish. 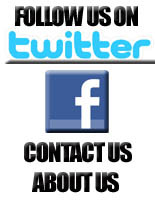 The Churchill is located at The Orlando Hotel at 8384 W. 3rd Street., Call 323-655-8384. 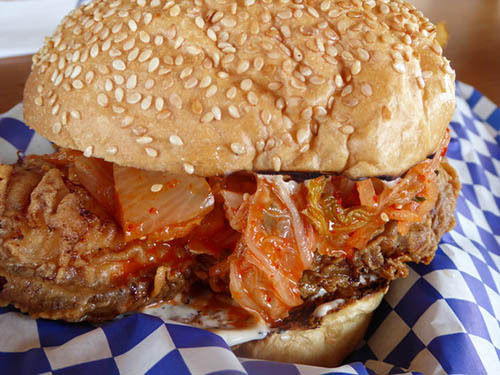 A pizza shop may not be the first place you think of for a good fried chicken sandwich but the folks at Pizza Roman, a neighborhood pizza joint that’s walkable for me, used to be Cube and Cube was pretty famous for its fried chicken. So the fried chicken is solid here and the “bread” is made of pizza dough so there’s a nice, unique slant there. And at $10 for the sandwich and house chips, this is probably the best fried chicken sandwich deal you’ll find and the sandwich is killer too. It’s the best of both worlds: good eats and good savings. Pizza Romano is located at 615 N. La Brea.